Nice umbrella and it's held up well being exposed all year to the Florida sun and rain. Arrived quickly and is just as described. Happy with purchase! Thanks! Shade your outdoor dining table with the bronzed Guisti umbrella. The lightweight aluminum frame cranks open and automatically tilts for sun protection throughout the day. 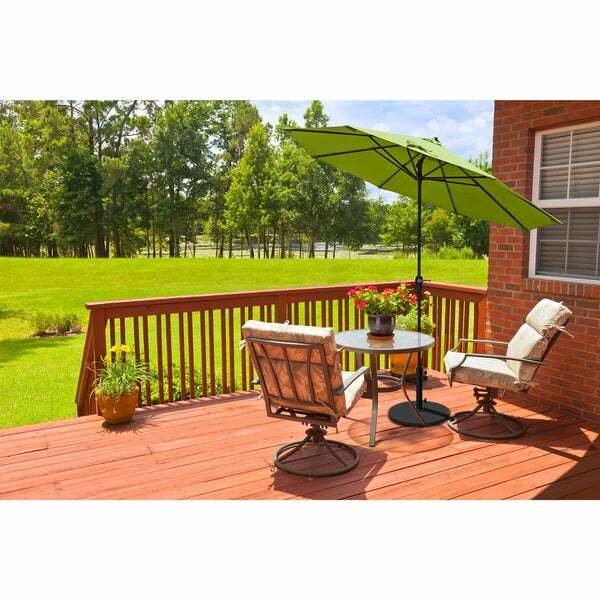 Choose from 20 UV-resistant canopy colors to brighten up your deck or backyard decor. Nice umbrella for the price. Lightweight, easy to move and easy to crank open. Tilt is minimal, but a nice feature. This is the second one I have ordered. First one was for outdoor table and it looked so good, I wanted a second for poolside. Good fabric, nice design and perfect size. Arrived in just 2 days, right size packing box and put together in a flash. Thanks Overstock! Just what we wanted. Helps block the sun and the tilt feature helps block neighbors view into our hot tub!!! Cheaply made, didn't work from the start. Cranked it open once and that was it. Plastic housing, loose fitting pole, did not crank shut. Photo much better than the real thing. Avoid this one. The color of the fabric is not as dark as in the picture. The delivery was quicker than I expected, and the function of the umbrella is as described. Excellent umbrella. Works perfectly on my patio. Really pleased and would recommend. So far so good. Fabric looks good and will know more about the durability and if color fades next year. Better than I expected. Light &amp; airy, blocks the sun but not the light . Looks lovely in my courtyard. Reasonably priced. Has not faded. Multiple color choices. "How long will it take for the umbrella to shipped to my house?" Please add the item to your cart with your zip code to see the shipping time frame.